We are so excited for Lancaster Food Co., an ASSETS client and a true social enterprise! Keep up the inspiring work! To view the original post by Kenneth Hilario on Philadelphia Business Journal, click here. A Lancaster, Pennsylvania, company — set to expand with additional facility space and more employees — raised its minimum wage, which is already higher than the state’s, in June and later this year it will begin offering employee stock options. Lancaster Food Company will be raising its employees’ minimum wage to $15 an hour, more than double Pennsylvania’s minimum wage of 7.25. Gov. Tom Wolf in March signed an executive order to raise the state minimum wage for state employees and contractors to $10.15 an hour, a 40 percent increase from $7.25. The hike would take effect for all state contracts signed or modified after July 1 this year. Lancaster Food Co., which was started in 2014 by Charlie Crystle and Craig Lauer, however, in June this year raised its own employee minimum wage to $15 an hour. The company, the only certified organic food company in Lancaster, makes organic sandwich breads as well as organic maple syrup. Its products are sold in more than 110 stores, including Whole Foods Market and Wegmans. A $15-an-hour starting pay is not common for bakeries, Crystle told the Philadelphia Business Journal. It’s “top of the range” for small bakeries and average for longer-term employees at large manufacturers. Lancaster Food Company also plans to set aside 30 percent of the company for an employee stock option plan, which is expected to be formally in place by October. The company has 14 full-time employees and six part-time employees. The company expects to add another 23 employees over the next 12 months. About 13 of those workers will be in production. 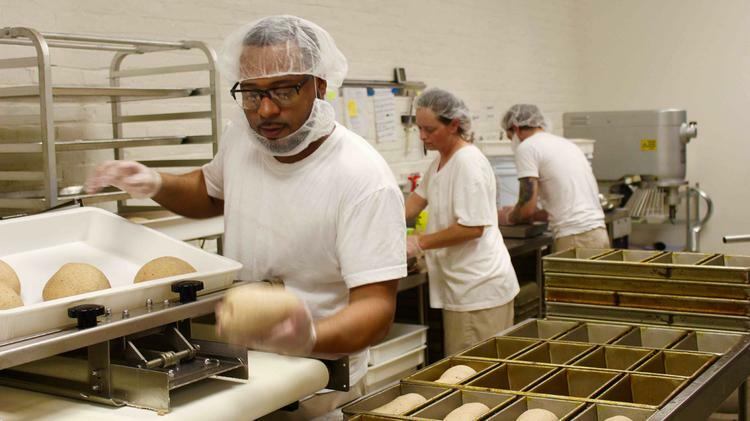 Lancaster Food Company said when it hires for most positions, they screen for poverty and actively recruit former prisoners trying to reenter the workforce. The Lancaster Food Company is currently in a 1,000-square-foot facility at 341 E. Liberty St. in Lancaster, but it will expand with an additional, 8,200-square-foot facility less than four miles away at 1879 Commerce Park East. The company has already started work to convert the space from a machine shop to a food manufacturing facility. The goal is to start production by the end of August. The facility on East Liberty Street will be used to develop new products. The 23 new employees will work at the new facility.